In the end, it was the bipartisan sense of urgency among lawmakers – the fast-building recognition on both sides of the aisle that this legislation needed the support of Congress -- that proved most stunning to observers. Support in Congress for the Colorado River Drought Contingency Plans took a big step forward on Thursday when lawmakers on a key House subcommittee expressed bipartisan – and, in many cases, enthusiastic – support for the effort to help stabilize the drought-troubled river system. Among those expressing strong support for the DCPs was Arizona Rep. Raul Grijalva, chairman of the House Natural Resources Committee. 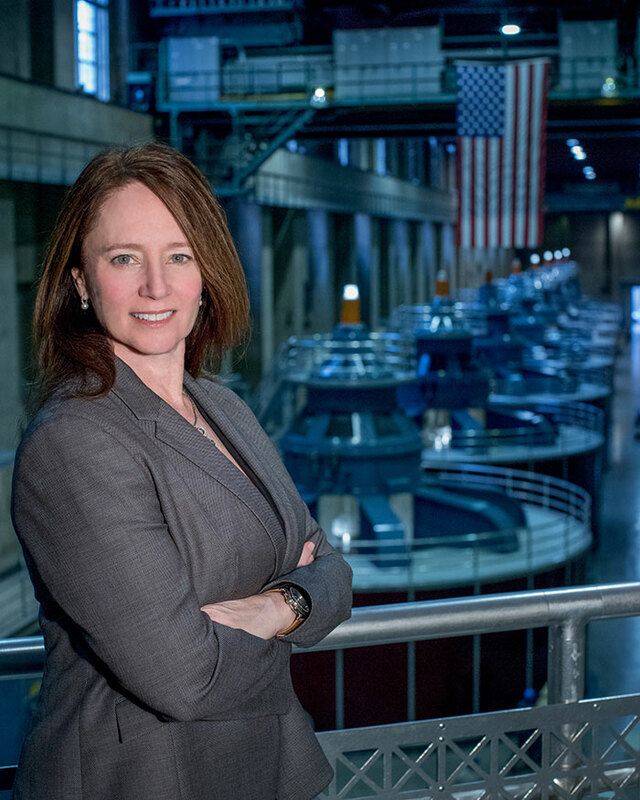 As the New Year approaches, compiling a list of the top stories in the Arizona water industry is always a challenge because there’s always a lot to choose from. But 2018 truly was more eventful than other years in recent memory. From the increased efforts of Drought Contingency Planning, to a wildfire season unlike any other, to the ongoing drought declarations within the Southwest, take a look back at some of the key moments in 2018, as they were reported by Arizona Water News. Getting to the Finish Line: What’s next for Colorado River Drought Contingency Planning? Arizona has worked over the course of several years with the other States in the Colorado River Basin and the United States to develop an interstate Drought Contingency Plan to protect Colorado River supplies. Within Arizona, stakeholders have been working to develop an Implementation Plan, a series of agreements that will govern the way that certain terms of the DCP will be implemented within Arizona once the DCP is effective. Read more about Getting to the Finish Line: What’s next for Colorado River Drought Contingency Planning? The interagency coordinating group that analyzes Arizona’s drought status on behalf of the Governor had some good water news and some bad water news at its Nov. 28 meeting. Read more about How Will AZDCP Fit Into the Colorado River Basin Drought Contingency Plan? The next step in the reinvigorated effort to bring a Drought Contingency Plan in Arizona to closure is scheduled for Tuesday, July 10, at the Heard Museum in central Phoenix. In case you hadn’t noticed, we’ve had some beautiful warm, sunny, dry days of late. 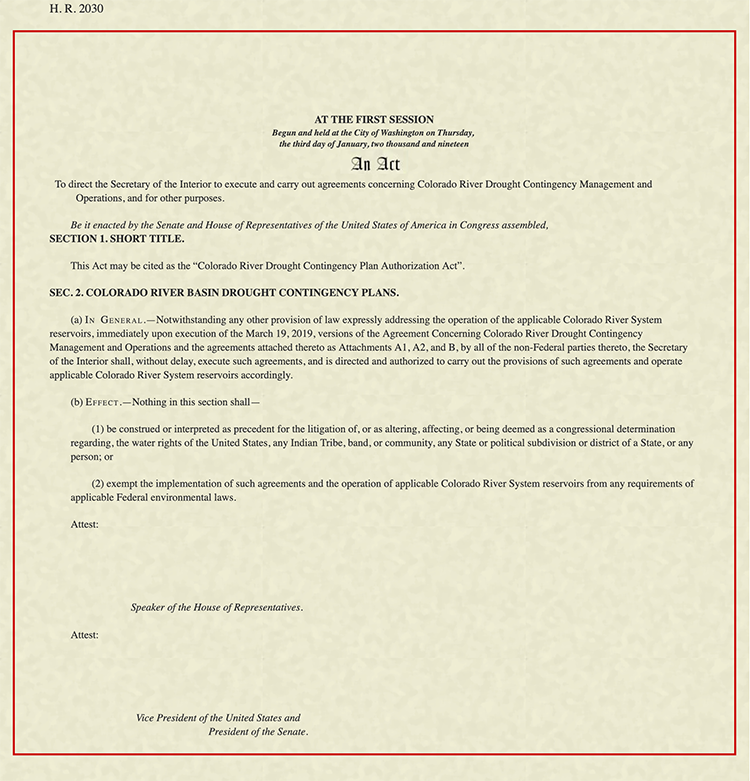 The cooperative measures on Colorado River water that the United States and Mexico agreed to in September – an agreement described, collectively, as “Minute 323” – have garnered a lot of media attention in the weeks since the documents were signed. This commentary by Arizona Department of Water Resources Director Tom Buschatzke first appeared in a special section on water policy published on September 29th by the Arizona Capitol Times. It is re-published here with the permission of Arizona Capitol Times. With an eye to long-term, binational cooperation and to managing a more stable Colorado River System, representatives of the United States, Mexico and the Colorado River Basin States of the U.S. on Wednesday celebrated the "entry into force" of an agreement deemed essential to the System’s future. Arizona Department of Water Resources Director Tom Buschatzke told a U.S. Senate panel on Wednesday that his state’s philosophy on preparing for long-term drought is focused on developing and improving the tools necessary to combat the effects of lengthy dry spells. The World Water Congress, an event hosted every three years by the International Water Resources Association to promote discussion and share knowledge about water issues world-wide, is meeting this week in Mexico. Participating as an invited panelist is Arizona Water Resources Director Tom Buschatzke. The conservation group American Rivers has rated the Colorado River the most endangered river in the country for 2017, notably the portion of the river that begins at Lee Ferry below Glen Canyon Dam, northeast of the Grand Canyon. Arizona Department of Water Resources director Tom Buschatzke detailed in an oped in Saturday's Arizona Republic the on-going, highly sensitive efforts to strike a three-state deal to leave a portion of the states’ Colorado River allocations in Lake Mead in order to keep the lake above critical levels. With a sweep of his hand toward vast, new wetlands blossoming at the southernmost corner of the Gila River Indian Community, Tribal Governor Stephen Lewis explained the dual purpose behind the tribe’s investment in the fast-rushing waters flowing near the site known as the Olberg Bridge. On Drought and the "Drought Contingency Plan"
The negotiations to find an equitable way to stabilize the Colorado River system and, specifically, Lake Mead have been underway for nearly four years now. In some respects, the parties at the table – including representatives of California, Nevada, the federal government and Arizona – largely have found common ground, in principle. Read more about On Drought and the "Drought Contingency Plan"
Over the years, the Department of Interior and the Bureau of Reclamation famously use the annual December meetings of Colorado River water-users to announce big policy changes. That didn’t happen this time at the annual Colorado River Water Users Association meetings in Las Vegas. 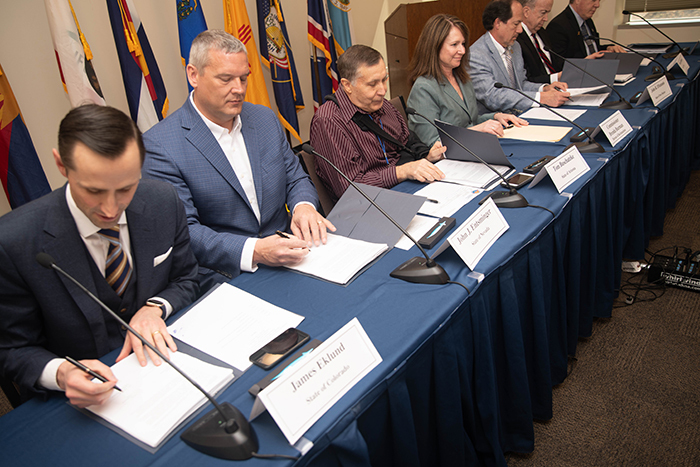 Despite a yeoman effort to push through an agreement on a drought contingency plan among the Lower Basin states, the many moving parts of the complex “DCP” agreement did not come together before CRWUA members parted ways.